Adam and Eve had sinned against God. After Adam and Eve realized that their eyes had been opened to the knowledge of good and evil because of their sin, they went and hid themselves. Adam went and made clothing from fig leaves to cover their nakedness, which symbolizes man's self-righteousness. God rejected Adam and Eve's fig-leaf religion and chose rather to kill an innocent animal to make clothing for them. This symbolizes the righteousness of God, which comes only by the Lamb of God Whom God sent into the world to SAVE SINNERS! Now 6,000 years later, people still make the same error, trying to deal with their sins by fabricating a manmade fig-leaf religion. Just as Adam made clothing from fig leaves, so do most churchgoers make up their own rules as they go. 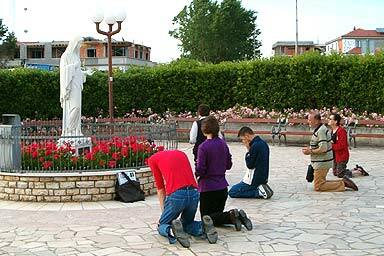 Catholics commit the sin of idolatry every time they bow and pray to Mary or any other statue of a saint. If you attend the Catholic Church, you DON'T love Jesus Christ, because if you did you'd love the Bible and not support a religion that corrupts the Scriptures and teaches a false gospel. This is not my opinion, this is what the Word of God teaches (Mark 7:6-13). Catholicism is a fig-leaf religion. If you are foolish enough to believe that, then you are rejecting the plainest teachings of Jesus Christ in John 14:6 that He alone is the only way to Heaven. Praying the Rosary to Mary is a road to Hell. Mary cannot help you in even the slightest way to enter Heaven. You either go through Jesus without any works of self-righteousness, or you burn in the Lake of Fire forever!!! You either have your own fig-leaf religion like Adam and Eve tried, and failed, or else you let God cloth you in the blood of Jesus Christ by faith. I'm sick and tired of professed Christians saying they love God, while supporting the hellhole of Catholicism, and worshipping the Beast through religion. What do you think that Image of Divine Mercy is? Very few people truly love God. You cannot sincerely say you love God if you reject His Word. John 4:24 teaches that God can only be worshipped in truth, which the Catholic Church is void of. You'll NEVER hear a priest encourage you to study your Bible. Instead, you'll hear your priest tell you to listen to the Pope, or listen to the priest. But they'll never direct you to let God work in your heart through the holy Scriptures. Why? It's because those rascals want to maintain control over the people. If they control you, then they have your money as well. It's not that hard to figure out. They don't want people to obey the truth. If every Catholic were to obey the truth, then they'd repent of their wickedness and leave the Catholic religion. They'd find a real church where the pastor is a man of God and preaches salvation by faith alone in the Lamb of God. I absolutely hate the Catholic Church! I don't hate people, I hate false religion that leads men and women into the fires of Hell. If you are a Catholic, you have been warned, Hell is real and you will go there if you don't forsake your self-righteousness; and instead turn by faith to God's dear Son Jesus, the Christ, for the forgiveness of sins (Acts 10:43). We are saved by faith in Jesus Christ, Who died upon THE CROSS for OUR SINS, He was buried, and He was resurrected from the dead three days later. Jesus only saves SINNERS! If you are a good person, then Jesus cannot help you, because you are conceited in your false righteousness (Romans 10:3-4). But if you are a wretched sinner, then Jesus will save a sinner like you and me. Amen! You must come through the cross of Calvary for salvation, not the damned Catholic religion. 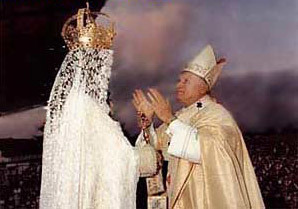 Photo to left: Pope John Paul II bowing in worship to Our Lady of Fatima (Mary). If you're worshipping within the Catholic faith, then you might as well be over in India worshipping a potato! Catholic priests are infamous for discouraging people from reading the Word of God. They don't want anyone thinking for themselves. But Jesus commanded us in John 5:39, “SEARCH THE SCRIPTURES; for in them ye think ye have eternal life: and they are they which testify of me. And ye will not come to me, that ye might have life.” What a precious Scripture! Jesus told the crowd to SEARCH THE SCRIPTURES, and in so doing they would learn how to have eternal life; but by rejecting the Scriptures, they have refused God's plan of salvation. Catholics follow a FALSE gospel of self-righteousness and sacramental salvation (which is a road to Hell). The Catholic Church has been elevating their own fabricated traditions for centuries as being equally inspired with the Bible. Catholics can't make up their minds; they keep changing their beliefs. It wasn't until 1950 that Pope Pius XII declared the unbiblical doctrine of THE ASSUMPTION OF MARY as official Catholic dogma. Since Catholics teach the lie that Mary was born without a sin-nature (what they call, the Immaculate Conception), and that Mary never committed a sin, there was a problem because the Bible teaches that sin brings death (Romans 6:23). To solve the contradiction, the Vatican simply decided to add to their doctrines that Mary was bodily taken into Heaven and never saw death. There's nothing in the Word of God to support ANY of those hellish doctrines of devils taught by the Catholic religion. You may not heed my words of wisdom, but consider yourself warned. The Bible is God's Word; not what some religion says. Catholics actually believe that when the Pope speaks, he speaks Ex Cathedra (i.e., in the place of God). Blasphemy! You will one day stand before God and give account for why you remained in the Catholic Church, when you were repeatedly warned that is was evil and contrary to the Scriptures. It is our responsibility as individuals to seek out the truth, and respond accordingly. BILLIONS of lost sinners are being led into hellfire by the Catholic religion. Oh, the loss of humanity! I plead with you to come out, come out away from the Devil's table, and obey Jesus Christ! If you know that the Catholic religion is teaching lies, and they certainly do, then you shouldn't be supporting their church (which is no real Church at all). James 4:17, “Therefore to him that knoweth to do good, and doeth it not, to him it is sin.” It all boils down to whether you are going to OBEY God or continue in the unbiblical traditions of men. God will not accept one's fig-leaf religion, which is wicked self-righteousness. There is nothing you can do to take away your own sins. You have messed things up beyond repair. You and I need a Savior to redeem us back to God the Father. Jesus paid that price! We've heard that Jesus died for mankind; but moreover, Jesus died for God, so that the wrath of God the Father could be appeased against mankind for our sins, and a bridge could be built to reconcile us back to God. Thank God for the precious literal blood of Jesus Christ that washes our sins away forever (1st Peter 1:18-19)! Life is short. Every day that passes is one less day that we can live for Jesus as a Christian. If you are attending the Catholic Mass, then you are serving the Devil. You must decide if you love Jesus more than your family. I know so many people that are Catholic because all of their family is Catholic, and they will sadly one day go to Hell with their family. The hardest thing in the world is to break away from one's family tradition and follow Jesus instead. The decision is yours alone to make. If you are a blood-washed, born-again believer, then thank God that he has set your soul free from sin, and rejoice that you are a child of the King! Amen! Please forsake your fig-leaf religion; and instead turn to Jesus, the precious Lamb of God Who taketh away the sins of the world! Ultimately, everyone, without exception, must decide who they are going to serve . . .